But do international funds help your portfolio? In terms of return, it's hard to argue that they have, at least within most investors' experience. The past 25 years, large-cap U.S. funds have gained an average 691%, vs. 338% for international funds. U.S. funds have beaten international funds the past five, 10, 15, 20 and 25 years. Then again, companies in the S&P 500 get 46.2% of their earnings from overseas, and that's enough international exposure for anyone. If the S&P 500 is giving that much exposure, isn't that enough? And didn't Bogle just say in an interview he thinks US investing is just fine, international is not needed? I have thought the same. The international market has been in negative territory for the last 6 months or so. I think there's a significant difference between the two questions: Have international funds helped your portfolio over the past 5, 10, 15, 20, 25 years? and; Will international funds help your portfiolio over the next 5, 10, 15, 20, 25 years? Did you read the Vanguard white paper? I would, and have, argue that it is no mystery, it is US-centric thinking that as an outsider (i.e. a Canadian) isn't fully supported by the underlying theory of broad-based index investing. It is called home country bias. As long as one acknowledges the bias and makes an informed decision that acknowledges the bias, I don't think they are doing anything incorrectly. I just don't think it is a mystery. Peculiar_Investor wrote: Does Bogle's advice hold for non-US resident Bogleheads? If not, why not? If you believe in the underlying theory of indexing, purchasing a broadly based index based on market capitalization, why stop at your home country's border? staythecourse wrote: I have NO clue why no one will ask Mr. Bogle what his advice would have been if he was born in Japan and not America. As a non-US resident I'd be very interested in the answer, particularly as a Canadian where our share of global market cap is in the 5% range. Certainly makes you look at the question and answer from a different perspective. Vanguard wrote: we conclude that, in general, U.S. investors may have some justification for marginal home bias, but investors in Australia and Canada might consider increasing their allocations to foreign securities. The results for U.K. investors are mixed, with less overall concentration in domestic securities but still room to diversify. gtt561 wrote: .... companies in the S&P 500 get 46.2% of their earnings from overseas, and that's enough international exposure for anyone. This is a recycled topic that gets raised (seems) monthly. Why would the discussion be different this month than last month, or the month before? By the way, Vanguard put a stake on the ground since 2006, and in 2012. Thank you for posting the links. Vanguard answers my questions. It doesn't surprise me at all, given the recent outperformance of domestic stocks over international stocks, that we're having this conversation here on a weekly basis. I suspect that if the opposite were true and international had beaten domestic recently, that these threads wouldn't exist. YDNAL wrote: This is a recycled topic that gets raised (seems) monthly. Why would the discussion be different this month than last month, or the month before? You can also use the Forum search to look for only those topics with international investing in their title. Investing 100% into the U.S isn't really comparable to investing 100% in Japan, is it? No country comes close to the market cap of the U.S.
Not that I agree with only investing into U.S. stocks, but is U.S. the only country where it would be acceptable? WWJD - What Would Jack Do? A year ago, there were weekly discussions about "why invest in bonds?". Then bonds did quite well, and those conversations rarely show up now. Now after a crummy year for international, it's "why invest in international?". I predict that if domestic stocks do poorly this year, next year's topic will be "why invest so heavily in US stocks?". John3754 wrote: It doesn't surprise me at all, given the recent outperformance of domestic stocks over international stocks, that we're having this conversation here on a weekly basis. I suspect that if the opposite were true and international had beaten domestic recently, that these threads wouldn't exist. Instead, you would get threads on why isn't everyone 50/50 US/Int'l. Exhibit A of why Bogleheads are not immune to recency bias/performance chasing. Trevor wrote: Investing 100% into the U.S isn't really comparable to investing 100% in Japan, is it? No country comes close to the market cap of the U.S. In 1989 Japan was 41% of the worlds equities. Is that materially different than todays US situtation. And yes they were made up largely of multinational companies who recieved a large chunk of their revenue from foreign sales. Surely that diversification would prevent exposure to home market risk right? :) In retrospect that percentage was inflated by the bubble and it turns out the Japan was not destined to economically dominate the world. Investing internationally is unlikely to help your long term returns. Developed stocks markets should all return about the same over long periods (50+ years) unless their are outside political events (i.e. losing a war, getting your means of production bombed, ....). However it does help increase your SWR by reducing your sequence of risk. The 4% rule is set by US stock performance during the 70s. It turns out those happened to be much better years for the international investor and your SWR goes up to about 4.5% if you would have shove a bunch of money into international stocks. Who knows if that will hold true in the future. This conversion is a lot like sitting down in early 2009 and saying why hold stocks period. After all they have underperformed bonds for the past 5 and 10 year periods. Or sitting down in 2008 and asking why do I hold so much US stock since it has dramatically underperformed international stocks (over the past 5 and 10 year periods). It is easy to say to buy out of favor assets (i.e. maintain your 60/40 US/international split, buy stocks when they drop 40%, buy bonds when they are underperforming stocks). Most people find it very hard to sell winners to buy losers though and even more find it difficult to stay the course. I wasn't really trying to spark a debate over if one should invest in international. Rather, if the exposure to international already present in U.S. funds is an appropriate amount to bypass investing in international asset class separately? According to Vanguard, it is not. 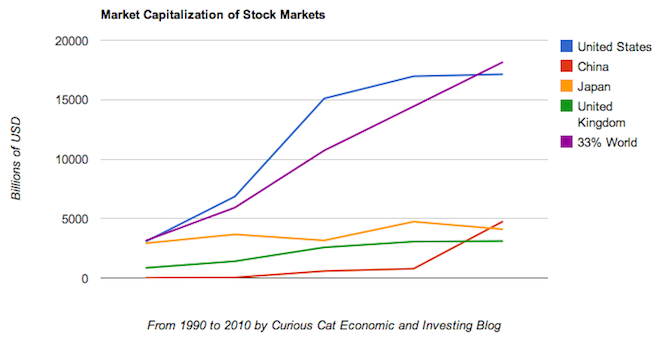 Japan's stock market cap was larger than that of the US for a few years in the late 80's. That's now seen as way out of line (and Japan is now around 7% of world cap v US around 37%) but predictions are hard, especially about the future, whereas hindsight is easy. Anyway that trivia fact isn't the real point but rather while all other stock markets now are much smaller than the US, they aren't so much smaller that home-biased investors might not reasonably convince themselves their own stock market is big enough to represent 'the market', especially if not nearly 100% in stocks. And it doesn't contain as much currency risk nor 'other risks' (of inadequate or excessive regulation, lack of transparency also often perceived in biased way; you commonly see statements on this forum implying that US financial regulation is far superior to that of any other country, which is nonsense, though it's reasonably good, home biased investors in other well regulated markets might feel theirs is superior). And that's worth considering as US based investor, even though the US market right now is almost as large as the rest of the top ten combined. Yes, very short-sighted. The Boglehead rule is you stay diversified. What happened to buy low? Doesn't sound so good when an asset class is actually underperforming? If you aren't happy with at least one of your investments, you aren't diversified. And just think of the benefit--If we have a market crash, international won't have so far to fall. Trevor wrote: Investing 100% into the U.S isn't really comparable to investing 100% in Japan, is it? Why do you think it's different? Just the same home country bias as anything else.... now maybe that will pay off in the future... or maybe not. That earnings thing is put out a lot.... but where is the evidence that shows earnings sources define the price movements of a stock? Stocks appear more affected by local market topics than earnings sources - well more by random events. There is no mystery. I don't want 100% of my money in one country even if it is my own. And I don't want 100% of my investments tied to the US Dollar. During the 2000's, International investing was no mystery at all as International outperformed the US. Now it is the other way around. A lot of it has to do with the strength of the US Dollar against other currencies. These things go in cycles. Vanguard recommends about 20% in foreign equities, and Bogle also suggests no more than 20%. So they agree, but for different reasons: Vanguard says that 20% is about optimal. Bogle says that, if you insist on having international, 20% is about right because it won't do much of anything; it won't help you much and it won't hurt you much. Would a rising dollar necessarily produce lower returns for US stocks compared with Foreign stocks? I would think eventually this would start to hurt US exports, thus hurting large cap US companies. markmow wrote: I have thought the same. The international market has been in negative territory for the last 6 months or so. Six months? On that you're basing your investing decisions? In 1989 the Japanese stock market was larger than the U.S. stock market. Interesting question. As one with a more-than-modest home-country bias, I always asked myself the same question. But, that said, I have my requisite 15% in international;, with a smidge in emerging, and I promise not to peek. gtt561 wrote: The past 25 years, large-cap U.S. funds have gained an average 691%, vs. 338% for international funds. U.S. funds have beaten international funds the past five, 10, 15, 20 and 25 years. And European stocks have beaten US stocks over the last 50 years (Credit Suisse Yearbook 2014). These things go back and forth. nedsaid wrote: And I don't want 100% of my investments tied to the US Dollar. This is really key for me. My fixed income is 40% of my life savings and 100% in the USD. My stocks are 60% of my life savings but 60% international. All told, however, 64% of my life savings, plus my homes and job, are in the USD. That is enough concentration for me. Thanks for the information, I did not realize just how high the Japanese market was in 1989. That said, 1989 Japan market capitalization can be said to be so high because of overvaluation. That is, if you believe the true intrinsic value at that point in time was not as high as the market price. This is an excellent article from IFA concerning why to invest globally with a value and small cap tilt, given the relatively poor performance of international compared to US large cap in 2014. I personally am 50% US, 50% international, 50% large, 50% small, 50% value, 50% blend. Like others, I have a tendency to second guess my plan based on recent performance of asset classes. This article and a recent podcast by Paul Merriman reminds me why I should stay the course! Last edited by jimtramont on Fri Jan 16, 2015 6:09 pm, edited 1 time in total. I was just about to post almost the exact same question as the OP. I've got a spreadsheet that tracks various indexes back to 1972. When I compare various combinations of S&P and MSCI World ex USA, the long-range data doesn't appear support that the international piece much of a difference. When I ran the same figures from 1980 - 2012, the figures came out decidedly in favor of US-only investing. Past performance does not predict future results. Frankly, I was hoping for a little more insight than this. msi wrote: Past performance does not predict future results. I side with Jack and don't feel it is necessary. I never held it and I have been investing in my 401K for 20 years. On a side note John Bogle and Warren Buffett don't think it is necessary either. I think I'm in good company. My question is, what are the reasons for doing so, and how does the data support that conclusion? stemikger wrote: I side with Jack and don't feel it is necessary. I never held it and I have been investing in my 401K for 20 years. It might not have looked like that in 1990. Unless this data is wrong, the USA and Japan had about the same market cap in 1990. Granted, this chart, it you took it back another 5 or 10 years, would have shown that Japan in 1990 has risen a lot into a bubble. 1) Person A says X therefore X must be true. 2) This is the way I've always done it and it works fine for me. Hank Moody wrote: I was just about to post almost the exact same question as the OP. I've got a spreadsheet that tracks various indexes back to 1972. When I compare various combinations of S&P and MSCI World ex USA, the long-range data doesn't appear support that the international piece much of a difference. As we all know, the early 1980s started a big bull market. That's why the 1980-2012 numbers look better than 1972-2012. It's all about the start and end dates. And I agree. For the people that spout "past results do not predict future results" I can somewhat agree. But now I ask the question, what do you base your asset allocation on? Are you just randomly throwing money into different funds? Are you using rules of thumb with no understanding of them? When you pick a sports team to win, do you just pick a random team? No.. you pick a team that has consistently done well, you look at what players will be playing and the specific match up and try to use statistics to determine who will win. I'd find it troubling if you just threw darts at a dartboard to pick the winners in a sports game, similar to picking an asset allocation. This discussion was going on in another thread this week and someone offered up current yields and posted relevant data to support that. However, I highly doubt the majority of people use current yields in setting their domestic vs international asset allocation. Agreed, so where does that leave us? hoppy08520 wrote: As we all know, the early 1980s started a big bull market. That's why the 1980-2012 numbers look better than 1972-2012. It's all about the start and end dates. Past performance is meaningless to me and I do not use it in my allocation decisions. I base my asset allocation on my knowledge of the what the assets underlying each fund mean. Bonds for example are a contract and their returns are based on a specific set of parameters (duration, credit, etc), stocks represent part ownership in a corporation and their returns are based on dividend yield and future earning growth. Note that none of this has anything to do with what happened in the past. Thanks, I was just curious. Run the math to how things look with a 4% inflation adjusted withdrawal starting in 1972. My math has the US only person with 58k today while the 70/30 international person has 146k (100% international would have 200k). Now that is a result of international outperforming in the early years but given how none of us have a clue which market is going to outperform over the next 10 years, it is worth thinking about the risk you are taking on by not diversifying and if you need to take it or not. I can't justify taking the risk need to get 200k (picking 100% US or international) when the downside is ending up with 58k. I like the middle path where I end up with 146k. YMMV. And yes no one knows how things will turn out in the future and the past diversification might not show up in the future. 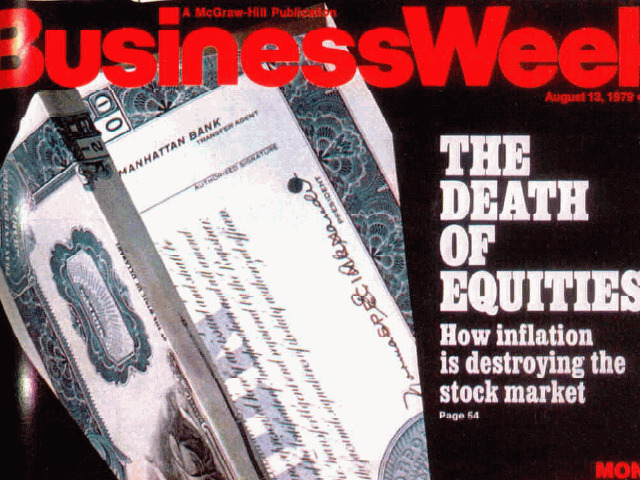 I didn't use inflation adjusted returns because I didn't have the international data, but 10,000 invested in domestic equities in 1972 results in $769, 661 and in international equities $451,876. However, domestic equities exceeded international equities 49% of the time. Above: Vanguard Health Care Fund vs. US Market, past 30 years. Try it yourself - I wasn't kidding: Vanguard Health Care beat total market the last 5 years, 10 years, 15 years, 20 years or 30 years ... so anyone who is using a similar argument against holding international: why not just buy healthcare? Every time an asset class heats up, there are countless threads that turn up. Remember gold, emerging markets, commodities of yesteryear. I just stick to my 3 funder knowing I am sticking to the plan. Although I gotta admit, I am thinking of getting a tiny speculative component to my portfolio but for some reason I am more of a contrarian and am watching Greek and Nigerian etfs right now. Browser wrote: Vanguard recommends about 20% in foreign equities. This is old advice. Their Target Retirements are 30 percent in foreign equities. I suspect it will creep up to 40 soon (no insider knowledge, just speculating). Hank Moody wrote: Frankly, I was hoping for a little more insight than this. Imagine having this conversation in 1972 and looking at data from 1942-1972. Would you have thought it possible that Soviet Union would not only fall but become the world's sixth largest capitalist economy? How about the ability to buy Chinese stocks on American exchanges, or that they would become the world's second largest economy? What about the creation of the Euro, the WTO, NAFTA, or any of the other things which changed the world economy and subsequently equity returns? For me personally, I want the diversification benefits from having international exposure. I don't think, "this is what has happened, so maybe it'll keep happening" is as useful in making the decision. How did you decide what portion of your portfolio to allocate to international equities though? I don't think most people are saying all or nothing, people are wondering how others came up with X% for international exposure. When I pick a sports team to win against a spread I evaluate the line and look for the undervalued team. In fact, that's often a team that didn't do so well last week and now everyone's down on them. That's where the value is. Along those same lines, to me it seems like now is as good a time as any to buy more international. Not abandon it all together. I have an international allocation of 40% and I'm sticking to it. It's an allocation percentage I've chosen based on what I've learned from the writings of many smart people. I'm sure there are many Japanese investors who thoroughly regret that they didn't diversify. I don't think I'll look back on my portfolio in 2035 and curse my younger self for being diversified.